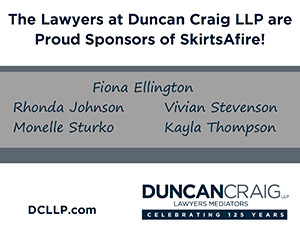 Six designers compete to create the official skirt of SkirtsAfire 2019! Skirts are judged on creativity and use of materials. Skirts must be constructed only of found materials, and must be wearable. Take a closer look at these stunning designs in our Skirt Gallery and learn more about each designer’s inspiration and concept! Tip Toeing Through Pansies – David Cameron examines gender as a construct and works to promote the dismantling of gender roles. The design incorporates childhood images into the flowing structure of the gown as a means to reclaim their youth as both male and female. Confessions of a Shopaholic – Treasa Webb’s skirt is a social commentary on overconsumption, and the need to self-fulfill through our buying habits. Her design juxtaposes the relationship of those values by transforming handbags in a manor where the original decorative details including textural elements, hardware, and trims are being sewn and rearranged into an interesting and wearable design. Human Heart – Fakhra Abrar is always inspired by the human heart and based her design on it. The human heart is made up of good and evil thoughts layered together. What others see as the red colored welcoming heart is just the top layer. Beneath are the layers of angelical and demon thoughts. Fakhra designed the skirt in a heart like shape with different layers. The top red layer represents the personality others see while underneath black and white layers signify demons and angels within. Rurally Gentrified – Kelly Johner is inspired by textures, forms, and colors of natural and man-made objects. She collects materials, alters them by taking them out of context and stripping them of their original function, allowing her to speak metaphorically about the stories we tell ourselves about who we are in this world. My River – Cool, clear, and constant, My River. Jane Kline has been inspired by the gentle beauty and exquisite form of her new canine companion. As a workable motif, she has shaped mirrored plexiglass into various impressions of her dog’s ears, in order to create her fluid reflective skirt. My River, my muse. She Sails – Kim Neeser has a deep spiritual faith, and believes a great part of her identity is founded in her God given gift of creativity. Kim can relate to the hard yet beautiful outer shell and free spirited nature of the design. No matter where the tide takes her she has a deep-rooted sense of home within her own shell. In her creativity she sails.